As you take advantage of the operational and economic benefits of virtualization and the cloud, it’s critical to secure your virtualized data centers, cloud deployments, and hybrid environments effectively. Because if you neglect any aspect of security, you leave gaps that open the door to web threats and serious data breaches. And, to meet data privacy and compliance regulations, you will need to demonstrate that you have the appropriate security, regardless of your computing environment. 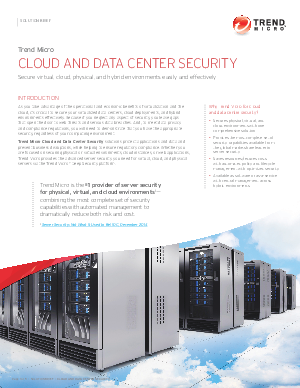 Trend Micro Cloud and Data Center Security solutions protect applications and data and prevent business disruptions, while helping to ensure regulatory compliance. Whether you are focused on securing physical or virtual environments, cloud instances, or web applications, Trend Micro provides the advanced server security you need for virtual, cloud, and physical servers via the Trend Micro Deep Security platform. Download this white paper to learn more about the Trend Micro Deep Security platform.